Investment Banking Websites is a portfolio of the best investment banking website design by web design firm (cleverdesign.com). All of our sites are responsive, which means they work on all devices from desktop to laptop to all mobile devices. 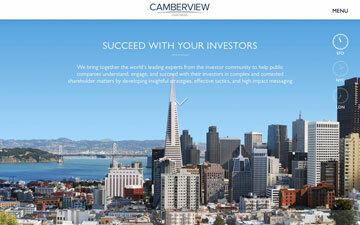 Our investment banking site design and development capabilities include: website design, and content management systems. We also offer investment banking firms logo design. The firm was founded in 1980. Here is the Google Mobile-Friendly Test to see if your site is ready for "Mobilegeddon" where sites are now penalized in search rankings for not being mobile-friendly. 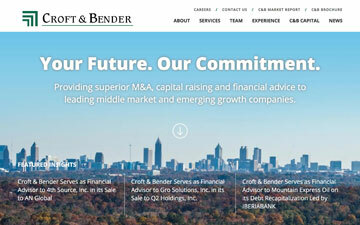 Croft & Bender focuses on M&A, capital raising and financial advisory services around the world. For this, we developed a unique map to show their global influence. CamberView is an advisory firm helping companies succeed with their investors in complex and contested shareholder matters. Based in SF, NYC and London, we created an interesting clock/cityscape carousel. 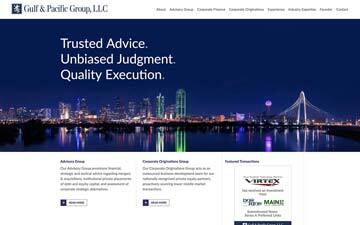 Gulf & Pacific is a hybrid Advisory, Corporate Finance, and Corporate Originations firm. The site weaves all of these together in a clear and concise manner. 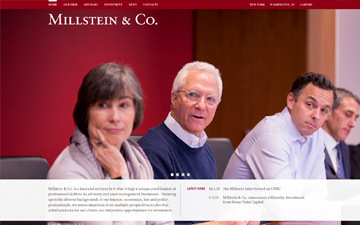 Millstein & Co. develops solutions for complex corporate and public finance issues. Collaboration amongst their diverse staff is essential and we emphasized that with wonderful candid photos. 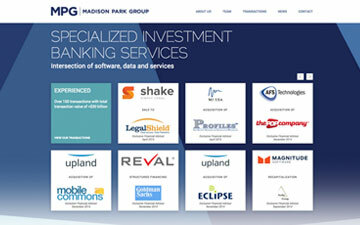 Madison Park Group specializes in the unique intersection of software data and services. We created a tombstone-forward site with clean tiling and backgrounds. 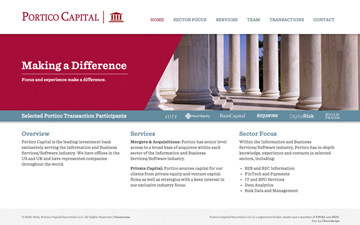 Portico Capital is the leading investment bank for information and business services/software industry. Their client list is so unique, we ran a scroller on the homepage for it. 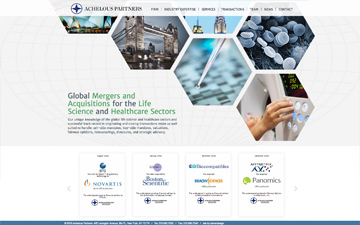 Achelous is a New York-based investment banking firm that focuses on life science and healthcare sectors. We used great photography throughout with a smart Transactions page. 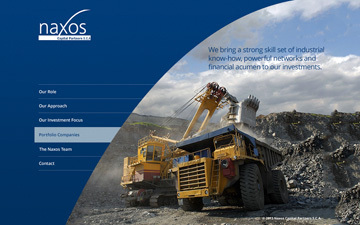 A Luxembourg-based investment banking firm that emphasizes all aspects of industrial from the heavy machinery to the most intricate high tech, we used specific imagery from their investments and punctuated the swoop in their logo as a crop line. PMCF is about expertise, integrity and results. We built in a carousel showcasing how their team is organized by industry with specializations in specific sectors. 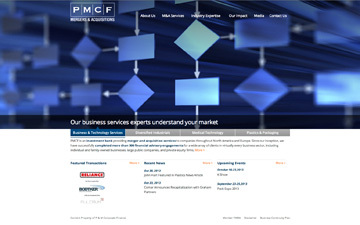 PMCFâ€™s core service offerings are a theme on every page of the site as well. 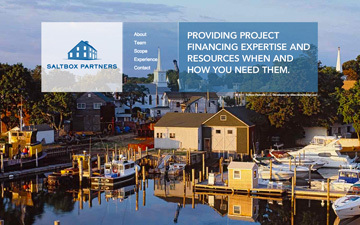 Saltbox provides advisory services in the energy sector, especially power and coal mining. They were looking for a very different style logo and website. We developed from themes based on the founderâ€™s home and perspective. 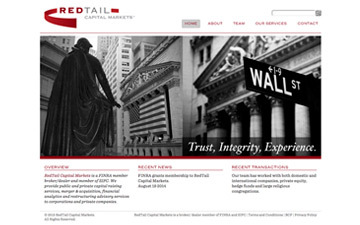 RedTail Capital Makets offices are very close to the exchange and they wanted to reflect their trust, integrity and experience. We did so by using interesting perspective of Wall Street shots. 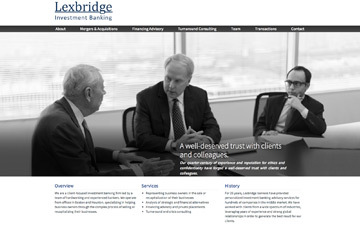 Lexbridge is a Boston- and Houston- based investment banking firm that specializes in the process of selling or recapitalizing their businesses. We used candid shots around their offices to give an intimate look.